Welcome to Hare Goalkeeper Academy Camps! Welcome to the Hare Goalkeeper Academy Camps. Our mission is to provide young players with the opportunity to learn and prepare for a higher level of goalkeeping and competitive soccer. We want to maximize the potential of individual players in a challenging, fun atmosphere. Whether you are a player just starting out, a seasoned player looking for an edge to raise his or her game to a higher level, or an experienced player looking to find out what it takes to play at the collegiate level, the Hare Goalkeeper Academy offers a training program and environment for you that is second to none. The Academy is open to boys and girls, ages 10 through 18. The Hare Goalkeeper Academy will be working in conjunction with Westminster College Soccer Camps this summer with their College Bound ID Camp and the Titan Soccer Camp (Residential & Commuter Camp). The Goalkeeper ID Academy is one-day camp offering boys and girls who are entering 2019 fall grades 9-12 to train with Jerry Hare, Director of HGA and the Goalkeeper Coach at Westminster College along with Girish Thakar, Head Coach of Westminster College Men’s & Women’s Soccer. Current members of Westminster College Soccer teams will be our camp assistants. The Goalkeeper ID Camp is for the serious goalkeeper with ambitions of playing collegiate soccer. We recommend this camp for anyone who plays competitively at the club level or competes to play for the varsity team at their high school. development and evaluation purposes. A Player Profile Form is included in the confirmation packet that will be sent out upon receipt of camper’s registration. The Goalkeeper ID Camp includes on-field instruction, campus presentation, campus tour, lunch, small-sided games and full-field games. At the conclusion of camp, you will have better understanding on what it takes to compete at the collegiate level. The Goalkeeper Residential Academy is a residential & commuter camp open to boys and girls, ages 10-18 who are dedicated to goalkeeping. This camp is designed for the serious goalkeepers, who have aspirations to play soccer at the high school and collegiate levels. For high school goalkeepers, the training format will be similar to the College Prep Goalkeeper Academy. This camp will be conducted by Coach Jerry Hare, Director of HGA and the Men’s & Women’s Goalkeeper Coach at Westminster College. Current members of his goalkeeping unit will be the camp assistants. The camp consists of morning technical training and speed & agility training sessions followed by afternoon sessions with field players that will specifically deal with in-game management techniques in small-sided games. Topics covered include controlling/instructing your defense, set plays (corner kicks, free kicks), restarts and wall building, penalty kicks, keeper positioning in relation to the ball in play. During evening sessions, players will participate in full-field games. Coach Jerry Hare and Westminster College Head Coach Girish Thakar will be continually monitoring and mentoring the keepers individually throughout the games. The HGA philosophy revolves around developing the keepers both mentally and physically. The instruction and activities are designed to challenge all keepers both in terms of technique and decision making ability. As always, along with learning, we strive to ensure a fun environment and will provide a variety of activities that will help players develop a sound keeper mentality, refine techniques and even enjoy improving critical goalkeeper specific fitness levels. This camp will push goalkeepers to their limits to be successful. There is a 1:8 coach-to-player ratio, so as to sharpen the individual development of each player. The camp’s professional staff will train and mentor the goalkeepers and ensure that they maximize their potential and improve their skills before leaving the camp. as it is to make a save. The coaching staff will be led by Gerald “Jerry” Hare, Director of Hare Goalkeeper Academy and Goalkeeper Coach for Westminster College Men’s & Women’s Soccer. The HGA and Westminster College Coaching Staff includes top-level college, high school, ODP and club coaches. They all have many years of experience playing and teaching soccer of all levels. The coaches on the staff are all certified and nationally licensed from United Soccer Coaches (formerly NSCAA), United States Soccer Federation (USSF) and the United European Football Association (UEFA). Members of Westminster College Men’s & Women’s Soccer will serve as assistants. For listing of our camp staff, click here. · T-shirt for every player. · 1:8 coach-to-players ratio, personal attention assured. · Speed, Agility & Quickness training / Plyometric training. · Pre-season preparation for the upcoming fall season. · Coaches with passion for the game. · Meet and create new friendships with other players. · Written evaluation for high school goalkeepers. Weather Policy: Our top priority is the campers’ safety. We will train and play outside in the rain. If we are outdoors and lightning occurs, we will immediately leave the field to go indoors. We will not return outside until 25-30 minutes after last lightning strike. Scheduled check-in and check-out times must be met by all campers regardless of weather conditions. During inclement weather, the drop-off and pick-up locations for daily commuter campers at assigned dorm, either at Kiski School or Westminster College. Tuition: Tuition for Residential Academy campers at Westminster College includes instruction, HGA / Westminster t-shirts and all meals beginning with dinner on first day and lunch on the last day of camp. The tuition for GK ID campers includes HGA / Westminster t-shirts, instruction, lunch and dinner. 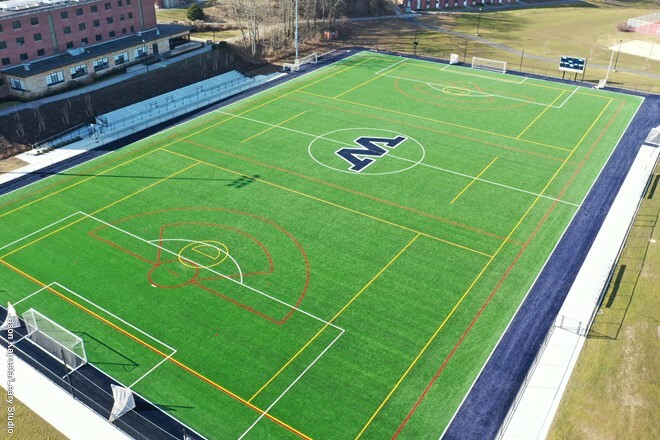 Facilities: Our Goalkeeper ID Academy and Goalkeeper Residential Academy will be held at Westminster College, one of the best small college campuses in the United States located at New Wilmington, Pennsylvania, an hour north of Pittsburgh. Westminster College sits on a 300-acre, tree lined campus with 22 buildings, 8 athletic fields including 4 soccer fields, 10 tennis courts, a 100-acre outdoor laboratory, Brittain Lake for boating and a fitness center. The field training sessions will be held on Harry Burry Stadium (turf) where Westminster College plays Division III soccer during the regular season. Westminster College is easy to get to by car from all directions with major interstate highways and the Pennsylvania Turnpike nearby. The Pittsburgh International Airport is a 60-minute drive to Westminster College. All of our camps are within 60-minute drive from downtown Pittsburgh and Pittsburgh International Airport. Meals: The residential and commuter campers will eat their meals at Westminster College Duff Dining Hall. Medical: A certified athletic trainer will be on duty on campus at Westminster College. A doctor is on call at UPMC Jameson Hospital within 15-minute drive from Westminster College campus. Because of the rigorous daily schedule, each camper should come to camp in good physical condition. Our medical staff will be on hand at check-in to answer any questions or address any concerns regarding medication or other medical issues. Medical History Form: Upon receipt of a camper registration and medical release forms, a confirmation packet, which includes a medical history form, will be sent out by email that needs to be completed by parent or a medical doctor. Physical exams conducted as of September for the current school year may be attached to our Medical Form provided all necessary information is provided. It is imperative that you remember to bring your medical form to camp. Please note that a camper cannot participate without a completed medical history form. Player Profile Form (high school goalkeepers only): The Player Profile Form is for the high school goalkeepers for Goalkeeper ID Academy and Goalkeeper Residential Academy at Westminster College in conjunction with the College Bound ID Camp and the Residential & Commuter Soccer Camp. This form will be provided for purposes of evaluation and recruitment. The form will be available in the confirmation packet that will be sent out by email upon receipt of camper’s registration. Parking: For camps at Westminster College, high school commuter campers must park in one of the Student Lots T-Y near Harry Burry Stadium. For campus map at Westminster College, click here. For residential campers who drive to Westminster College must leave their cars in the parking lot next to the assigned dorm. For camp safety, campers who drive to camp must give car keys to the Camp Director, Jerry Hare. The keys will be returned to commuter campers at end of each day and for those residential campers, will get their keys back at check-out on the last day of camp. For those parents who are driving their son or daughter to commuter camp at Westminster College, can park their car in the parking lot next to Harry Burry Stadium. Parents are welcome to watch any field session. IMPORTANT RULES: No tobacco, alcohol or drugs of any kind are allowed at all Hare Goalkeeper Academy Camps. Any violation of this rule will result in immediate removal from camp at the parent's expense. Also, the campers are responsible for any damages they might cause to any camp facilities or equipment, except when on the field during training. Thank you for your understanding. Copyright © 2019 Hare Goalkeeper Academy. All material on this site is the exclusive property of Gerald Hare / Hare Goalkeeper Academy.